It’s springtime, which means with the warmer temperatures your pet will likely begin to shed its wintertime coat. Both cats and dogs (Did you know that cats can shed up to seventy-five thousand hairs in a single day—amazing!) shed constantly, and the extra hair around the house means extra time cleaning. But there are a few ways to keep up with those loose hairs, and here are a few of the ways to prevent complete pet hair takeover this spring. The span of time during which your pet sheds excessively will depend on the amount of grooming you do. The more you brush him or her the quicker the loose under hairs will be removed. Models/Types of brushes vary, but, when you have to brush a dog with a long and thick coat, one such style of pet hair brush is a fur rake. A fur rake has metal teeth that offer little to no give when combed through a coat, and the teeth are pointed and spaced close to pry up the underfur. For those of you who are tired of constantly having to clean the masses of floating pet hair from hardwood floors, consider the robot-vac. There are numerous types these days, and it is a bit of an expense; but these types of vacuums can be programmed to vacuum rooms several times a day, keeping the floors cleaned with little effort. Another method for those of you with wood floors is to use a microfiber-style mop—something with a wide head—because these fibers are magnets for loose pet hair. Yes, a broom and traditional dust pan will also work just fine. Pet hair that accumulates on furniture is best removed with either a lint roller—the old stand-by in-a-pinch method for all pet owners—or use a vacuums pet hair attachment. These attachments usually have spinning brushes that pick up the pet hair. 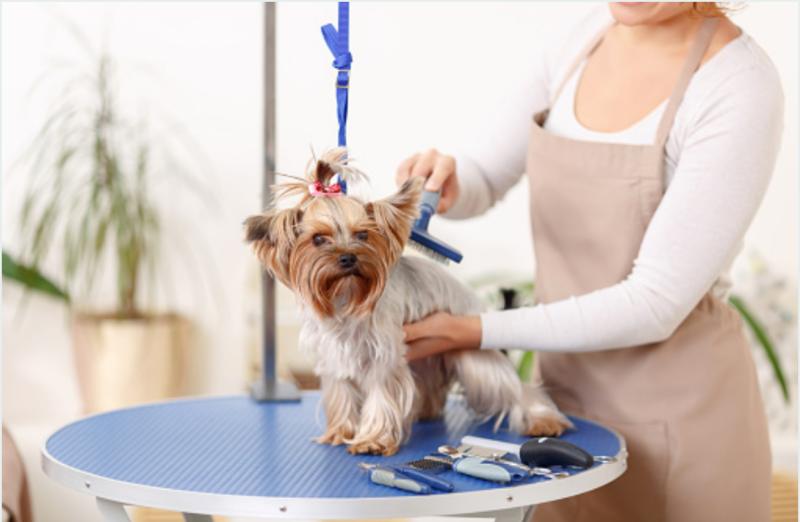 Hopefully you and your pet enjoy the pleasant springtime weather, and remember to keep to your pet’s regular grooming schedule with your professional groomer at Groomindales.